• First Red Flag: Justin W. Rice et al. 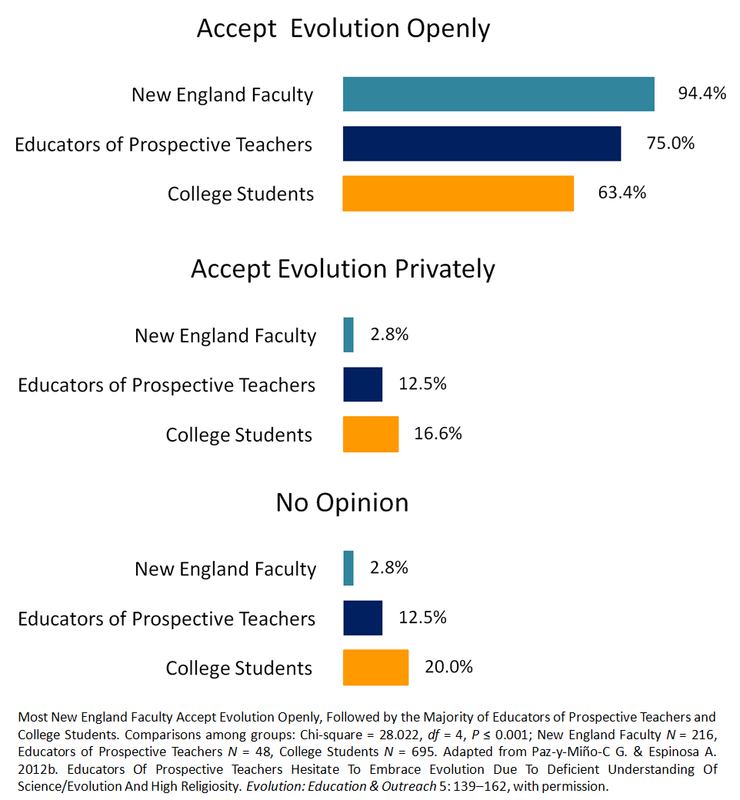 (2015) suggest that our research (Paz-y-Miño-C and Espinosa 2011a, 2012a) on acceptance of evolution in New England (sample of science and education faculty at 35 colleges and universities) is invalid. Yet, Rice et al. conduct a comparable study, four years later, at a single institution in the Midwest of the country, and generate analogous results. Back in 2010 when Justin W. Rice et al. suddenly criticized our research on acceptance of evolution, we became suspicious that these authors –whom we have never met at international conferences– had a more sinister motive to attack our scholarly work than simply pointing at academic disagreements. We inferred that our 2009a,b papers in Evolution Education and Outreach (EEO) had taken Rice et al. by surprise, and that the quintet of authors targeted us for having published in an area that became of their interest. But that was not our only misgiving: Rice et al. –we speculated– did single us out due to our openly secular approach to examining the evolution controversy, which contrasted with Rice et al.’s pro-faith theistic-observance of evolution (God in the background of causality: creationism in principle, distant creationism). And, as argued below, it seems like we were correct in our suspicion. The corresponding author in the 2015 study, Justin W. Rice, places himself at “Palmer College,” in Davenport, Iowa. However, the accurate name of the school is Palmer College of Chiropractic. Why did Dr. Rice omit the “chiropractic” part of the school in his affiliation? Dr. Rice must be aware –from the news and international lawsuits— that modern medicine questions the scientific rigor of chiropractic. 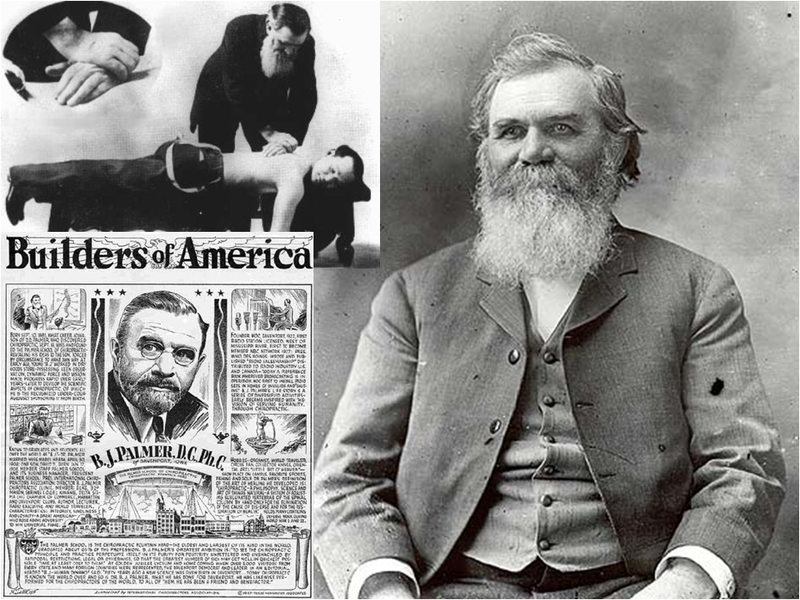 But let’s be factual: The National Center for Complementary and Integrative Health at NIH considers “chiropractic” a health care profession, despite its historical credentials: Canadian David Daniel Palmer (1845-1913) –a self proclaimed “magnetic healer,” who spent time in jail for practicing medicine without a license– founded the Palmer School of Chiropractic (1897), precisely in the town of Davenport. For a comprehensive review of the pseudoscience backbone of this type of all-purpose cure, see “Trick or Treatment” by Simon Singh and Edzard Ernst (2008). For our readers and subscribers we must clarify that we have never peer-reviewed any of the 3 publications Rice et al. have on education topics concerning evolution (one of them is entirely dedicated to us, 2010, to which not only we responded in 2011b, but also professor Antonio Lazcano, who wrote for EEO an extensive analysis of the Rice et al.’s note, in which world-authority-in-origins-of-life, Dr. Lazcano, dismissed Rice et al.’s belief that “evolution is not an explanation for the origin of life”). We have never chatted about the Rice’s team with our colleagues in the field of acceptance of evolution, not at NSF sponsored evolution meetings/panels to which we have been invited, not at scientific gatherings in the United States, Europe or South America where we have presented seminars, including at the 2013 World Evolution Summit in the Galapagos. Rice et al. –the people– are simply unknown to us. In addition, we do not have the cultural propensity, nor the tradition to go after specific individuals and diminish their scholarly work just because we have common curiosity about a topic. In fact, the science pie is huge and there is plenty to feast on. [Although, as atheists, we have publically rejected all types of creationism, including theistic evolution, creation science, Intelligent Design, BioLogos or evolutionary creation –which we consider “para-creationism,” and exposed those supporters of creationism in principle and in practice, or proximate or distant creationism in the science class, as we do it below –and for the first time– in our response to Rice et al. 2015]. There is no single peer-reviewed publication by us in which we promote treachery about our colleagues in order to uplift our work, or make it more valid by means of introducing rejection of the academic effort of our peers and, thus, facilitate a free ride for us, alone, without other contributors around. However, Rice et al., with no motivation from our part, have done precisely that in two occasions, first in 2010, and now in 2015 with their most recent paper in Evolution Education and Outreach. [Note that EEO has been an excellent publication venue for us; our interaction with the editorial office and editors has been cordial and we thank the journal for always welcoming our manuscripts]. Keep in mind that other colleagues have previously studied quantitatively the attitudes toward science by faculty at American colleges and universities (i.e. evolution, climate change, genetically modified organisms; see some references below). [It is pointless to dedicate energy to identify who pioneered this research since there is so much overlap of work, although it is true that we have always published 1-4 years ahead of Rice et al.] Therefore, our specific contribution has been significant only in the two areas described above; we have published 15 documents about them since 2009 to present. Now, these two areas, which happen to be conceptually important, have remained unexplored by researchers for more than a decade (the 2000s). Therefore, we are confident that our readers will continue to access our publications in the www venues. Just like evolution, our scientific articles, book chapters and reports will continue to exist despite Rice et al.’s effort to disparage them. Our First Response to Justin W. Rice et al. Note that we will never throw the first punch at a colleague and, out of the blue, start targeting a researcher or team of researchers who have never done anything to us. Why bother? Our responsibility is to contribute to the field of research: acceptance of evolution. Unfortunately, we must respond to Justin W. Rice et al. because our academic experience during the past two decades (since we immigrated to the United States), as well as the constant challenges we face to build our careers as Hispanic scientists in a competitive system, have taught us that authors like Rice et al. –motivated either by non-collegial competition, academic greed or pro-theism agendas in the teaching of evolution– will not amend. And we’ll continue responding. In 2010, Rice et al. published an article in EEO titled “The Theory of Evolution is Not an Explanation for the Origin of Life.” In it, they criticized our paper of 2009a “Acceptance of Evolution Increases with Student Academic Level: A Comparison Between a Secular and a Religious College,” also published in EEO (note that our paper was not about the origin of life, although we referred to it when explaining the scope of evolution). Long story short: the journal had invited Professor Antonio Lazcano, as world specialist in the origin of life, to comment on the Rice et al.’s note. Drs. Lazcano and Juli Peretó co-authored the paper “Should the Teaching of Biological Evolution Include the Origin of Life?” And their answer was –of course– yes. In their writing, Peretó and Lazcano [as they authored the paper] went back to Charles Darwin (letter dated 1871; see facsimile of actual letter; for excerpt see Darwin’s “Warm Little Pond”) to discuss that the concept of evolution obviously includes the origin of life –any opposition to this scientific/historical reality is silly– and that for the incredulous, or uniformed, Darwin himself connected chemical processes with “origin” and, therefore, with diversification of life. Who nowadays does not see it that way, or is caught in the drama of profiting from semantics (i.e. insisting that because scientists do not know exactly how life emerged from the inorganic to the organic and to the cellular level, the “theory of” or the “concept of” evolution cannot guide us to hypothesize how all began), is simply removed from productive science. End of the story: If world specialist Antonio Lazcano (backed up by 37 scientific studies and a supportive international scientific community) says that not only the “theory of evolution” but also the “concept of evolution” (here we are paraphrasing) do include the origin of life, we trust the judgment of the world specialist over the reckless preference of Justin W. Rice et al. (backed up by 8 references, three of them textbooks, and not a single study about the origin of life). We responded to the Rice et al.’s article in 2011, when EEO published our paper “On the Theory of Evolution Versus the Concept of Evolution: Three Observations.” Relying on 30 references, we debunked Rice et al.’s criticism and moved on [in retrospect, we call that event “Evolution Wars: Debunk I”]. Note that EEO is an open access journal, all the papers mentioned here can be downloaded freely from the links provided. Our Second Response to Justin W. Rice et al. Here we cannot be brief: Readers might be familiar with the principle that “it is very easy to fabricate a story, but it becomes lengthy and complex to debunk it” (although facts always defeat misrepresentation). Just take the example of creationism, the claim is so simple (i.e. the Maker, Creator, Intelligent Designer either built the material reality, or just ignited the laws of nature), yet science itself, plus those of us who oppose creationism in all its forms [including the foggy presence of the distant God in the background of causality, or the “harmony” between science and evolution, e.g. Rice et al. 2010, 2015] have dedicated much effort to overcome this pervasive belief (see Evolution Stands Faith Up: Reflections on Evolution’s Wars, Paz-y-Miño-C 2013), but with only relative success at the moment of changing the public’s opinion. Before going into the details of the Rice et al.’s 2015 paper in EEO, titled “University Faculty and their Knowledge & Acceptance of Biological Evolution,” let us state that we value the study, respect the data, the numerical analysis, and some of the conclusions to which the authors arrive. However, we cannot ignore Rice et al.’s lack of conceptual background, neither their bold endorsement of compatibility between science and religion, or their bending-over backwards contortions to misinterpret results and justify faith-based acceptance of evolution (below). What Rice et al. have found is interesting, but not new, since our research with a demographically more robust sample is by far more informative: 35 colleges and universities in New England (Paz-y-Miño-C and Espinosa 2011a, 2012b, 2013c), plus 281 institutions in the entire United States (Paz-y-Miño-C and Espinosa 2014b, 2015), in contrast to the one single school studied by Rice et al. (2015) in the Midwest of the country. Rice et al.’s research is more intriguing to us, as academics, than as recipients of their pejorative speculations about our work. Therefore, let us summarize first their scholarly claims. After that, we will dedicate some text to Rice et al.’s allegations, debunk them again –with data, and comment on the flaws of their manuscript. “…The view that biological evolution explains life’s origin(s) and that hypotheses become theories, which then become laws are just two examples of commonly held misconceptions…” — Rice et al. Follmann H, Brownson C. 2009. Darwin’s warm little pond revisited: from molecules to the origin of life. Naturwissenschaften 96:1265–92. [This article includes 170 references!]. Krauss LM. Cosmic evolution. 2010. Evo Edu Outreach 3:193–7. Peretó J, Bada JL, Lazcano A. 2009. 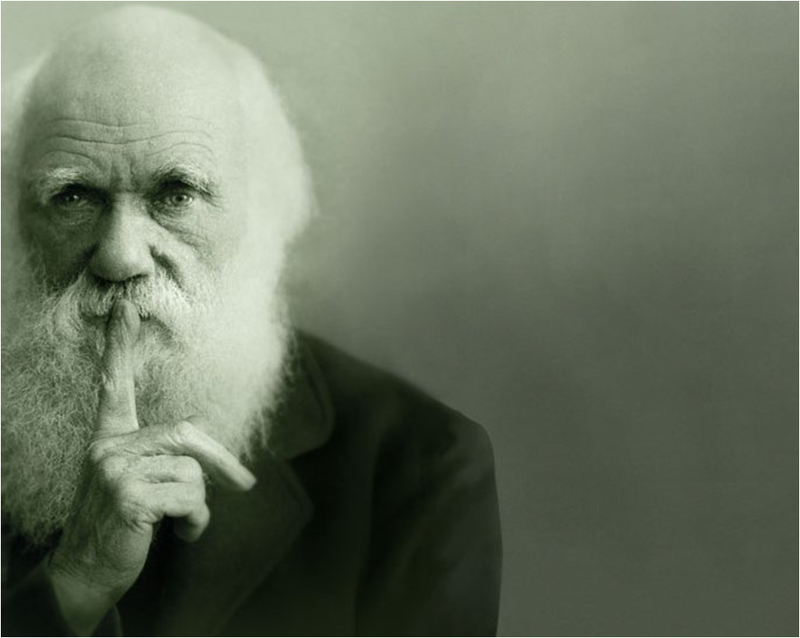 Charles Darwin and the origin of life. Orig Life Evol Biosph 39:395–406. Zaikowski L, Wilkens RT, Fisher K. 2008. Science and the concept of evolution: from the big bang to the origin and evolution of life. Evo Edu Outreach 1:65–73. Lakatos, I. 1978. The Methodology of Scientific Research Programmes, Philosophical Papers Volume 1. Cambridge: Cambridge University Press. The Lakatos’ 250-pages document explains the connection between theories, central hypotheses, auxiliary hypotheses, predictions and testing of hypotheses/predictions. This is an excellent foundation paper for those seeking to establish a research program. By the way, note that Lakatos makes the distinction between “research programs” and “research fields.” A must read for everyone. “Misconceptions about biological evolution specifically and the nature of science in general are pervasive in our society and culture. The view that biological evolution explains life’s origin(s) and that hypotheses become theories, which then become laws are just two examples of commonly held misconceptions. These misconceptions are reinforced in the media, in people’s personal lives, and in some unfortunate cases in the science classroom. Misconceptions regarding the nature of science (NOS) have been shown to be related to understanding and acceptance of biological evolution. Previous work has looked at several factors that are related to an individual’s understanding of biological evolution, acceptance of biological evolution, and his/her understanding of the NOS. The study presented here investigated understanding and acceptance of biological evolution among a highly educated population: university faculty.” — Rice et al. Indeed, we all agree that misconceptions exist, including, for example, believing obstinately that in matters of the origin of life, world authorities like Peretó and Lazcano (2010) are wrong, and that Rice et al. (both 2010, 2015) are right when insisting that biological evolution cannot offer hypotheses to explain life’s origins. “…results show that knowledge of biological evolution and acceptance of biological evolution are positively correlated for university faculty.” — Rice et al. Yes, “knowing” about evolution is associated with “acceptance” of evolution. Not only our studies with highly educated audiences (Paz-y-Miño-C and Espinosa 2009a,b, 2011a, 2012a, 2013c, 2014b), but many others with diverse audiences have shown comparable associations (here we just highlight Miller et al. 2006, Hawley et al. 2011 and Rissler et al. 2014; more about the relevance of these studies below). “Higher knowledge of biological evolution positively correlates with higher acceptance of biological evolution across the entire population of university faculty.” — Rice et al. Yes, for points 1 and 2 we have already shown positive associations between understanding of science and evolution [note that we recognize the distinction between “knowledge” and “understanding;” in our studies we have assessed “understanding,” our practical preference], with acceptance of evolution for three highly educated populations (New England: 35 institutions; United States: 281 institutions), i.e. combination of research faculty, educators or prospective teachers, and college students (Paz-y-Miño-C and Espinosa 2013c, 2014b), as depicted in the figures below. Note that Miller et al. 2006, Hawley et al. 2011 and Rissler et al. 2014 have reported –earlier than Rice et al. 2015— a positive association between science/evolution literacy and acceptance of science/evolution (not to insist on the Paz-y-Miño-C and Espinosa’s publications, which have covered highly educated audiences since 2009). Rice et al. just arrived and with no innovation. “This positive correlation [Rice et al. refer to number 2, above] is also present if the population is broken down into distinct theistic views (creationist and non-creationist viewpoints).” — Rice et al. First, there are conceptual problems here, and any sharp reviewer of a manuscript would have pointed out: “Distinct theistic views”? Really? Well, yes, of course, creationism is based on belief and belief systems (= theistic). However, “non-creationist viewpoints” labeled “theistic”? What is that? The latter is so wrong: When referring to the “non-creationist viewpoints,” Rice et al. make a huge conceptual mistake. They include in the “non-creationists” group what they call “Agnostic Evolutionists” and “Atheistic Evolutionists” (“atheistic”? The authors probably mean atheists). …Therefore, calling the “agnostic” or “atheistic” evolutionists the “non-creationists” might sound cute, but is incorrect [readers might be aware, however, that the terms “non-religious” and “non-believer” do exist, as we use them below, but “theistic non-creationists viewpoints” –as used by Rice et al.– does not make any sense]. It is like calling a human a “non-feathered vertebrate,” or a bird “a hairless, non-mammal,” or even a “non-primate.” This use of terminology is scientifically incorrect, and Rice et al. should have known better before venturing to –so carelessly– criticize others’ work. Lovering, R. 2013. God and Evidence: Problems for Theistic Philosophers. Bloomsbury. Philipse, H. 2012. God in the Age of Science? A Critique of Religious Reason. Oxford University Press. Stenger, V J. 2012. God and the Folly of Faith: The incompatibility of Science and Religion. Amherst: Prometheus Books. Martin, M and Monnier R. 2006. The Improbability of God. Prometheus Books. Martin, M and Monnier R. 2003. The Impossibility of God. Prometheus Books. In conclusion, we [Paz-y-Miño-C and Espinosa] did report, 1-6 years ago, high levels of understanding science/evolution among the atheists/non-believers/agnostics, and low levels of science/evolution awareness among the deeply religious responders to our surveys, i.e. New England researchers, educators of prospective teachers in the entire United States, and colleges students in New England (Paz-y-Miño-C and Espinosa 2009a,b, 2011a, 2012a, 2013c, 2014b). “Greater knowledge of biological evolution also positively correlates with greater acceptance of biological evolution across different levels of science education.” — Rice et al. * Source: Paz-y-Miño-C G & Espinosa A. 2014b. Acceptance of Evolution by America’s Educators of Prospective Teachers. NE Science Public: Series Evolution 2(1): 1-92. **Berkman MB, Plutzer E. 2010. Evolution, Creationism, and the Battle to Control America’s Classrooms. New York: Cambridge University Press. Left: Miller et al. 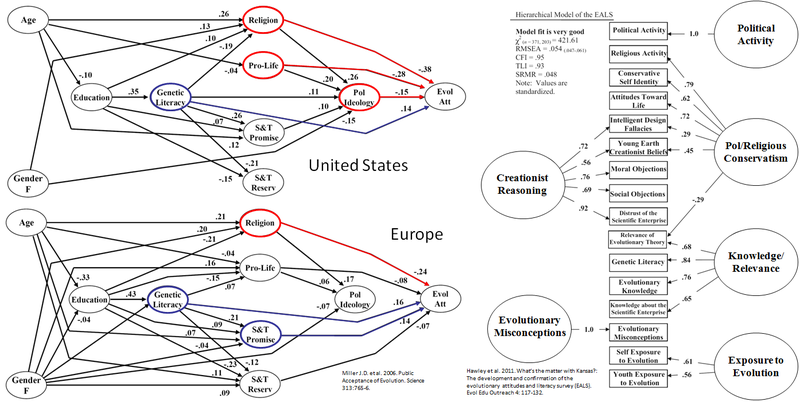 (2006 – download) found “religion” to be the most significant variable associated with negative attitudes toward evolution in the United States and Europe. Right: Hawley et al. (2011) reported that –for a college student sample in the Midwest of the United States– “creationist reasoning” and “conservative orientation” (political and religious) were negatively associated with exposure to evolution, knowledge about it, and positive attitudes toward its relevance. — Click on image to enlarge. Rice et al. (2015) ignored all the evidence above and proceeded to give the impression to the reader that their findings were novel. Not only that, as shown below, Rice et al. went for “The Clergy Letter Project” as a promising “instrumental view” to advancing understanding and acceptance of evolution. Pro Environment vs. 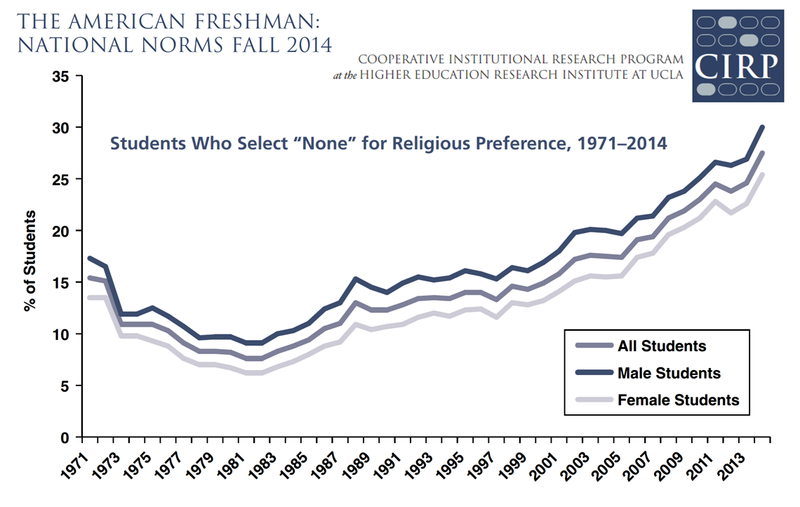 Pro Evolution Views by the religious, atheists and agnostics; graph by Josh Rosenau, data from Pew Research Center. – Click on image to enlarge. 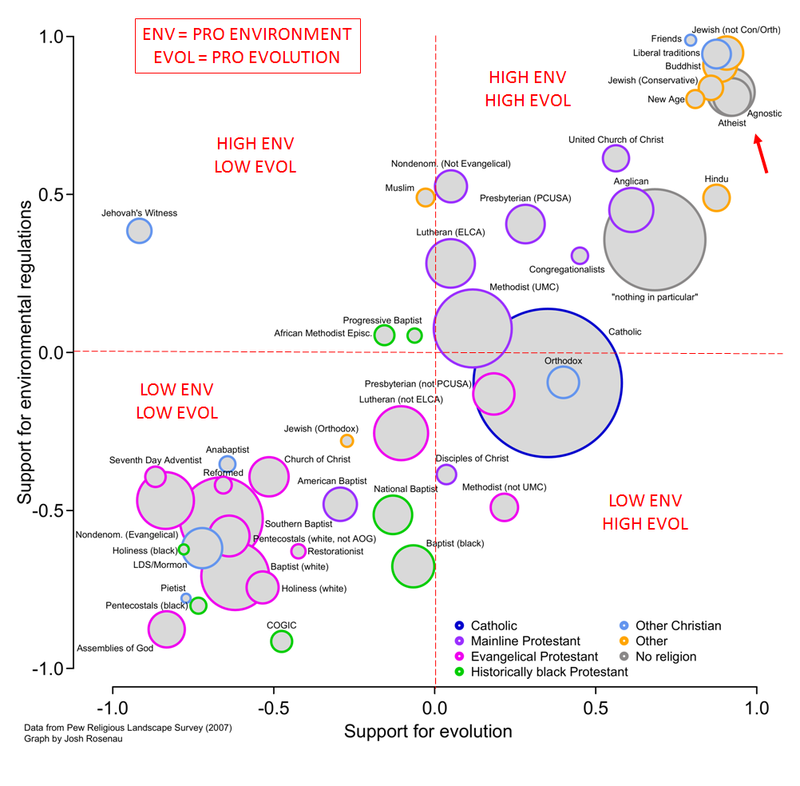 Briefly, the highest pro-evolution views (top right part of graph, the quadrat labeled HIGH ENV and HIGH EVOL) correspond to the atheists and agnostics (the closer-to-the-right circles), who also have high pro-environment views, although not as high as the nearby circles, which correspond to groups ranking slightly higher in “pro-environment” (the closer-to-the-top circles) than the non-believers (such groups include Jewish, Friends, Liberal traditions, Buddhist and –apparently– New Age). [Note that the circles overlap and statistical significance is not given]. 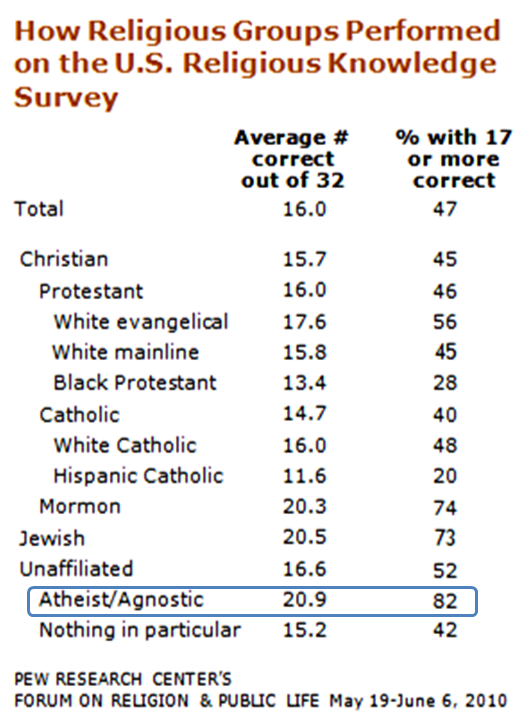 The main point here is that, in matters of “support for evolution,” the Rosenau’s analysis shows that atheists and agnostics rank highest, and that all religious groups rank below the non-believers [note in the graph how all other circles are located to the left of the atheists and agnostics]! “We also found that of the factors we examined, theistic view has the strongest relationship with knowledge and acceptance of biological evolution.” — Rice et al. Again, not new, just see above, other studies have shown that association: the very Miller et al. 2006, plus Rissler et al. 2014, or Hawley et al. 2011. Note that Rice et al. do not even cite the latter two crucial papers, and only refer superficially to Miller et al. (i.e. in broad statements about rates of public acceptance of evolution in the US), when, in fact, the structural equation models [central to the paper, see images above] used by Miller et al. 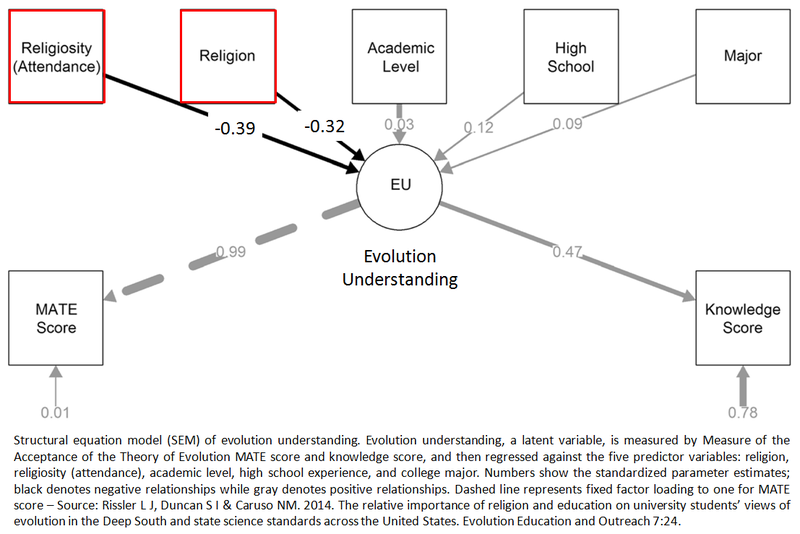 in the characterization of variables influencing evolution’s acceptance, already demonstrate that “religious beliefs” account for most of the variance against the acceptance of evolution in both American and European samples of public opinions! However, the new component in this whole discussion –at least from the perspective of our contribution to the field– is the conceptualization of the controversy in the context of the Incompatibility Hypothesis (i.e. Paz-y-Miño-C and Espinosa 2012b, 2013a,b,c, 2014a,b, 2015). We have postulated that the controversy itself is consequence of the incompatibility between scientific rationalism/empiricism and the belief in supernatural causation: “belief” disrupts, distorts, delays or stops the acceptance of evidence (the “3Ds + S,” Paz-y-Miño-C and Espinosa 2014a,b, 2015). IH is the central hypothesis in this field of research (if we aim at making it a field of basic science), and that is why Rice et al. ought to become familiar with the Lakatos (1978) paper on “The Methodology of Scientific Research Programmes” (above). This point is extensively examined in our articles and book chapters, and has been presented internationally at the Galapagos World Evolution Summit of 2013 (in fact, the 2014 book “Why Does Evolution Matter? The Importance of Understanding Evolution,” by Cambridge Scholars, editor G. Trueba, compiles the Summit’s keynote addresses; we have a chapter in it, “The Incompatibility Hypothesis: Evolution versus Supernatural Causation,” see also Paz-y-Miño-C and Espinosa 2013c). “What is the driving force behind an individual’s knowledge and acceptance of biological evolution? Some argue that an individual’s exposure to science, particularly to content on biological evolution, has the greatest impact on their knowledge and acceptance of biological evolution. Others suggest that an individual’s theistic view is the overriding determiner of their knowledge and acceptance of biological evolution. Determining the factors (and the strength of those factors relative to each other) that influence an individual’s knowledge and acceptance of biological evolution is an important step in being able to properly address the current issues with Biological Evolution Education (BEE). The analyses described here provide several unique insights into the interplay of factors influencing knowledge and acceptance of biological evolution…” — Rice et al. There is not a single citation in this series of broad statements and generalizations. None. This is such a departure from proper scientific writing: each claim written in science must have a supporting citation, particularly in a “discussion” where the authors are expected to contrast their work with the literature, and place the study in scientific context (i.e. the scientific significance). We invite the readers to actually examine the Rice et al. paper and verify the emptiness of the authors’ self-referent discussion. But to be fair, such discussion is not restricted to the paragraph above (= 121 words), that was only an example. The real discussion is 1,694 words long and it includes 15 references, the newest from 2009 (! ), although two citations are from 2015: an irrelevant link that does not pertain to science but to endorse religion (i.e. “The Clergy Letter Project 2015,” more about it below), and the relevant Short and Hawley (2015), which the authors forgot to list in the references. But, things get worse: out of the 13 paragraphs of text in the discussion, 9 do not have citations. No wonder Rice et al. are implicitly confident that they are leading the field. Although, again, and to their credit, the authors do cite themselves once in the discussion, as Rice et al. 2011. Can the reader hear the crickets? ” …Keeping in mind that knowledge and acceptance [of evolution] were positively correlated regardless of the participant’s theistic view, it begs the question “Is the most effective way to improve BEE [biological evolution education] to address theistic views?” The data appear to support answering this question in the affirmative, but whether such action is morally, ethically, or legally appropriate is a question that remains to be answered. In the author’s experience, addressing the relationship/conflict between theism and science can be fruitful in both the short-term and long-term for students. That said, students can certainly be made aware of efforts like The Clergy Letter Project (2015) which advocates for understanding and accepting biological evolution and seeks to demonstrate that science and religion can be compatible. Additionally, one of many rationales for teaching about the nature of science in all science courses, but particularly in biology courses, is address philosophical issues that can reduce resistance to learning about biological evolution and thus enhance acceptance of it…” — Rice et al. First: In the United States, there is separation between church and state. 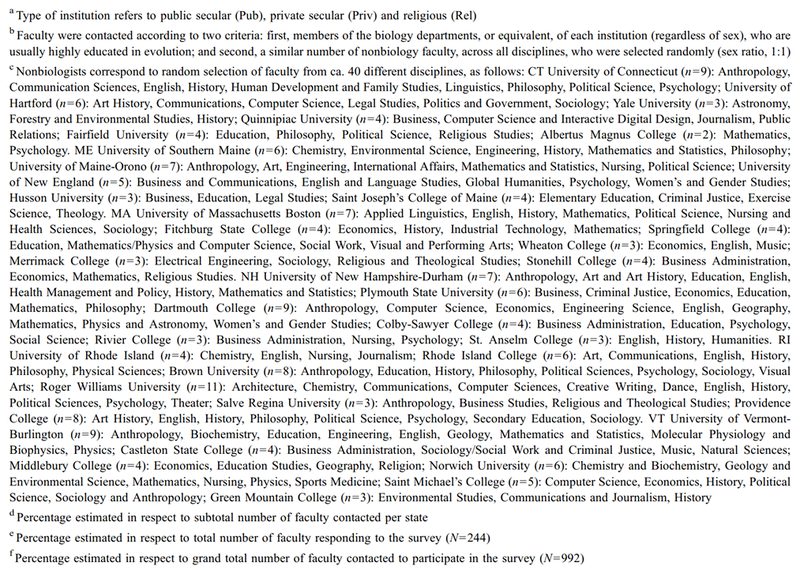 Anyone working at a public institution –or in acceptance of evolution– is reminded of this by the law itself (see Establishment Clause), or by those of us [and we are many, at least in New England were 70% of the faculty are secular at 35 colleges and universities —our research] who continue to advocate for keeping supernatural causation –in all its forms– out of the science class (= proper education). Second: “…Is the most effective way to improve BEE [biological evolution education] to address theistic views?” The data appear to support answering this question in the affirmative, but whether such action is morally, ethically, or legally appropriate is a question that remains to be answered…” Really: a question that remains to be answered? The answer, for any honest evolution professional, is NO (see Edwards vs. Aguillard 1987), since we separate clergy from government, belief from fact, and religion from science. Not morally, not ethically, and not legally are we allowed to combine science (the scientific truth) with religion in the science class, or anywhere for that matter, even if a poll suggests that an audience sees facts and fiction compatible. And Rice et al. must know, and remember better. Third: “…In the author’s experience, addressing the relationship/conflict between theism and science can be fruitful in both the short-term and long-term for students.” We have two observations here: (1) The “author’s”? See, another revelation: Justin W. Rice forgot that four other colleagues signed on the paper. Or, alternatively, the coauthors did not correct, with a sharp eye, Dr. Rice’s narrative. And (2), of course, addressing the interaction between religion and science can be fruitful, but only when we do not force evolution to marry supernatural causation, like when “creationists-in-practice” (or even “distant creationists” like Rice et al.) see empirical reality perfectly compatible with faith. And this is a capricious position, unfounded on and contradictory to modern science, and a persistent contributor to the very misunderstandings about evolution in the United States [note that 41% of Americans accept evolution conditionally: God created humans, and 28% insist that humans are not apes; IPSOS 2011). The misconception is right there: to believe that science and religion should date because the public takes pleasure in seeing them together. Back in 2010, Rice et al. manifested this sentiment when attacking our work, which we dismissed rationally and extensively in Paz-y-Miño-C and Espinosa 2011b. Fourth: “…students can certainly be made aware of efforts like The Clergy Letter Project (2015) which advocates for understanding and accepting biological evolution and seeks to demonstrate that science and religion can be compatible…“ What about making students aware of the Incompatibility Principle, or the overwhelming scientific evidence –not preferential pseudo science writings by theist researchers, who are a notorious minority in the US and abroad— in support to Nature without a Maker, Creator, or Intelligent Designer? Is “The Clergy Letter Project” the only 2015 reference that Rice et al. can offer in their paper to discuss such a scientifically and philosophically (= philosophy of science) rich topic? TCLP defines itself as an “endeavor designed to demonstrate that religion and science can be compatible and to elevate the quality of the debate of this issue.” And Drs. Rice et al. prefer to cite this enterprise in the shallow discussion of their paper rather than the peer-reviewed publications of scholars, available in the very journal Evolution Education and Outreach. Fifth: “…Additionally, one of many rationales for teaching about the nature of science in all science courses, but particularly in biology courses, is address philosophical issues that can reduce resistance to learning about biological evolution and thus enhance acceptance of it…” In essence, Rice et al. propose to replace –cosmetically, of course– the presence of blunt religion in the science class with theistic philosophy –a pacifier for students and their parents. How about, dedicating the science class to science, and discussing in it scientific philosophy with no theistic flavor (just see the references above)? That will be a sincere service to our 21st-century students/parents, consistent not only with the law, but also with our duty, as educators, to disseminate the truth. Now, we [Paz-y-Miño-C and Espinosa] support learning about theism, religion and faith in the context of the historical interaction between science and religion (remember that Pew Research Center polls –of 2010– demonstrate that atheists are more knowledgeable about world religions than the theists; see also ‘Atheists’ Knowledge about Science and Evolution,’ Paz-y-Miño-C and Espinosa 2012c). And that is proper liberal arts education, which we sponsor and practice. What we do not sanction, however, is the smuggling of “evolutionary creation” into the science class –a view championed by theistic-evolutionists– by means of reinforcing the idea that “as long as students accept evolution,” their scientifically wrong views about the origin of the universe or life (via a distant Creator in the background of all causality) are “perfectly compatible” with science. And that is exactly what Rice et al. sneakily proposed back in 2010, and now, openly, in 2015. “… Finally, [future] studies ought to also examine more deeply the theological views of those who do and do not accept biological evolution. As the Clergy Letter Project makes clear, many devoutly religious individuals maintain a deep commitment to a personal deity while also accepting biological evolution. Understanding this view and how it develops may be instrumental in advancing understanding and acceptance of biological evolution.” — Rice et al. 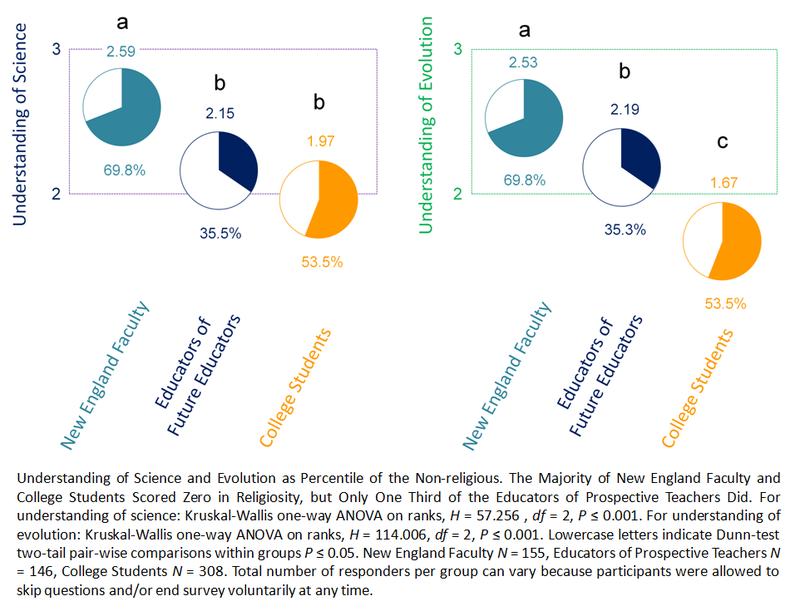 Average scores on knowledge of evolution (K) and acceptance of evolution measure (A) when grouped by groups: creationists, theistic evolutionists, and agnostics/atheists (source Rice et al. 2015). The authors are conceptually mistaken and bend over backwards to “see” in their results what they want to profess. This is precisely what we [Paz-y-Miño-C and Espinosa] call the “3Ds + S” cognitive effects of illusory thinking (belief causes disruption, distortion, delay or stop in the acceptance of any evidence; Paz-y-Miño-C and Espinosa 2014a,b, 2015). Rice et al. distort the meaning of the results before their eyes: the figure above, demonstrates that “agnostics and atheists” have the highest “knowledge” and “acceptance” of evolution, and that the “theistic evolutionists” (Rice et al.’s brand) and the “creationists” rank far below. 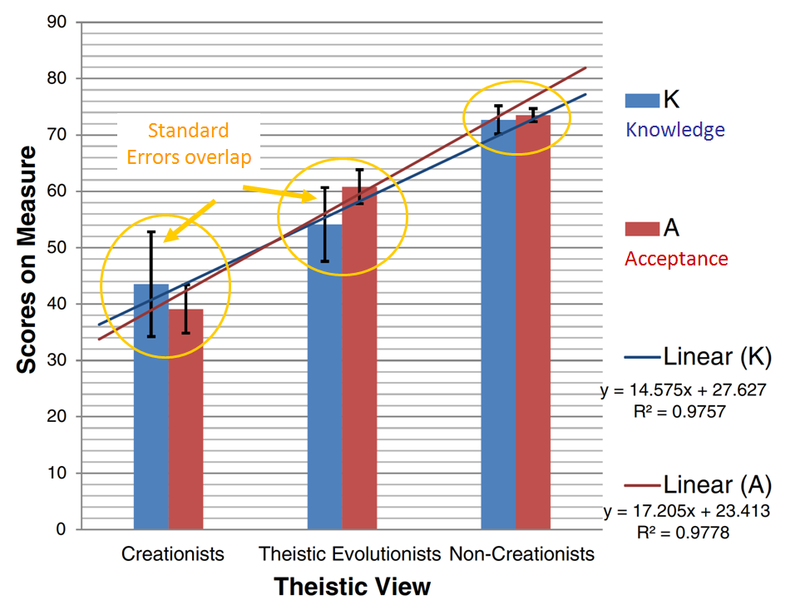 Not only that, in terms of “knowledge” about evolution the theistic evolutionists and the creationists overlap (see error bars in figure), which suggest they are more similar to each other than they are to agnostics/atheists. 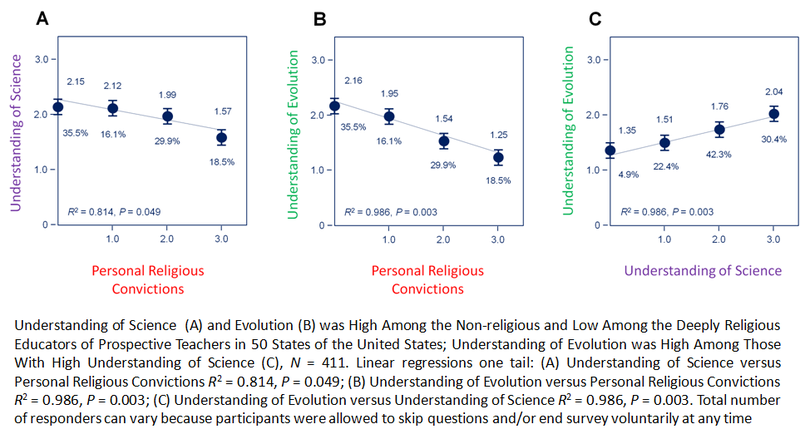 In fact, this supports our interpretation that religion is the factor causing the 3Ds + S effects in respect to accepting evolution (above), corroborated by the data available in Miller et al. 2006, Hawley et al. 2011 and Rissler et al. 2014. The very Rice et al. state “theistic view has the more pervasive influence on both [knowledge and acceptance of biological evolution] measures.” Yet, Rice et al. manage to bow to religion by finding in The Clergy Letter Project the “instrumental view” in advancing understanding and acceptance of evolution (above). Despite their own findings and statements, which, again, are not new (see our work Paz-y-Miño-C and Espinosa 2011a, 2012a, 2013c, 2014b), Rice et al. continue to campaign for a marriage between science and religion by invoking “The Clergy Letter Project” (2015). Rice et al.’s position is only consistent with a minority of research faculty who endorse faith in their lives (e.g. 29% in New England, Paz-y-Miño-C and Espinosa 2013c). And it is in disagreement with the vast majority of members of the United States National Academy of Sciences (only 7% believe in a personal God, something reported in Nature back in 1998). Yet, Rice et al. vote for coercing science to adapt to religion. And this is why such position is unsustainable in the long term, it is destined to vanish, as much as all “pro-theism-in-science” movements: theistic evolution, creation science, BioLogos or evolutionary creation, and their awkward cousin Intelligent Design. We examine this point in Paz-y-Miño-C and Espinosa (2015). Despite all this available information, Rice et al. take the path of The Clergy Letter Project, rather than the correct option, which is our duty to pursue as educators: proper science schooling, with no stoppers of thought or restrains on logic. 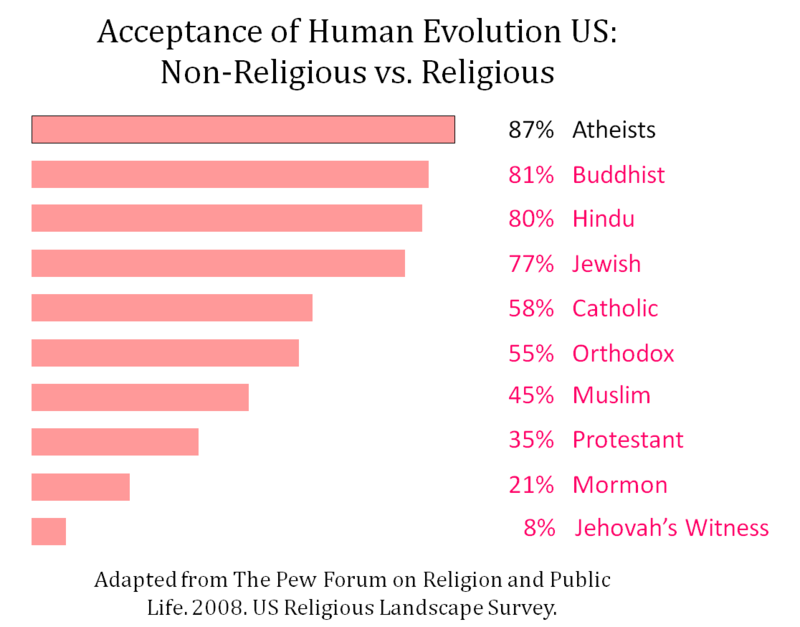 Acceptance of Human Evolution in the United States, Non-religious versus Religious – Adapted from The Pew Forum on Religion and Public Life 2008: Religious Landscape Survey – Click image to enlarge. Readers can find color images of these statistics and links to multiple sites in Paz-y-Miño-C and Espinosa 2013c, 2014b. In addition, Open Access image resources (PDF) for media, science journalists, researchers and educators (college and high school) are available at New England Science Public Series Evolution Vol.2 No. 2. “Faculty members at major research institutions are not only involved in the instruction of undergraduate students, but many are also active researchers at the forefronts of their chosen fields. 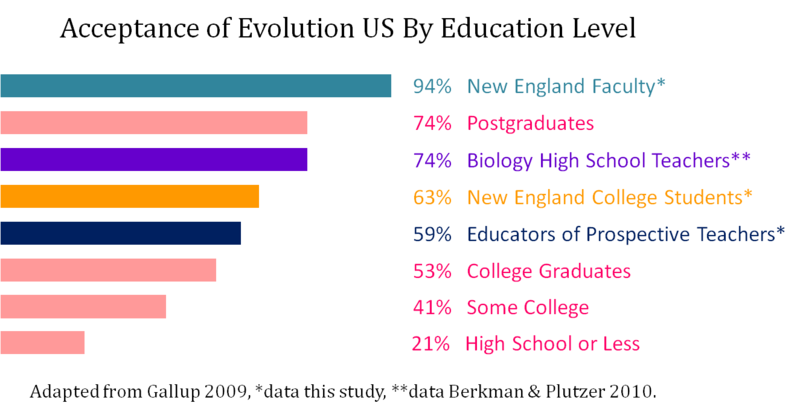 Given the expectation that universities and colleges will provide the best possible education for students, we were surprised to find only one data set regarding higher education faculty knowledge of biological evolution (Paz-y-Miño and Espinosa 2011 and 2012). 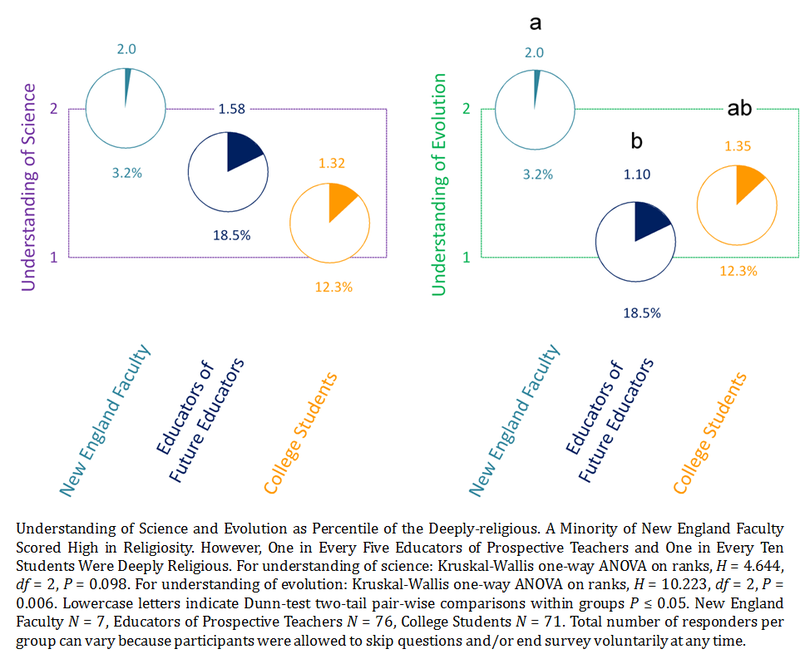 In both studies the authors were interested in measuring the views of college faculty on biological evolution, as well as their views on several related topics (e.g. creationism and I.D.). They used newly developed surveys that they claim accurately measure faculty “views about evolution, creationism, and intelligent design, their understanding of how the biological evolution works, and their personal convictions”. Previous work done in this field [here Rice et al. cite 13 articles from 1987 to 2011] has, however, demonstrated that accurately assessing views and understandings of biological evolution is challenging.” — Rice et al. This is a mischaracterization of reality. Rice et al.’s agenda is to make it look like (1) there are no studies involving university faculty in this field, and (2) the existing research –like ours– should be dismissed. That leaves Rice et al. alone. Well, not so fast, the studies continue to exist even if Rice et al. advertise to ignore them. 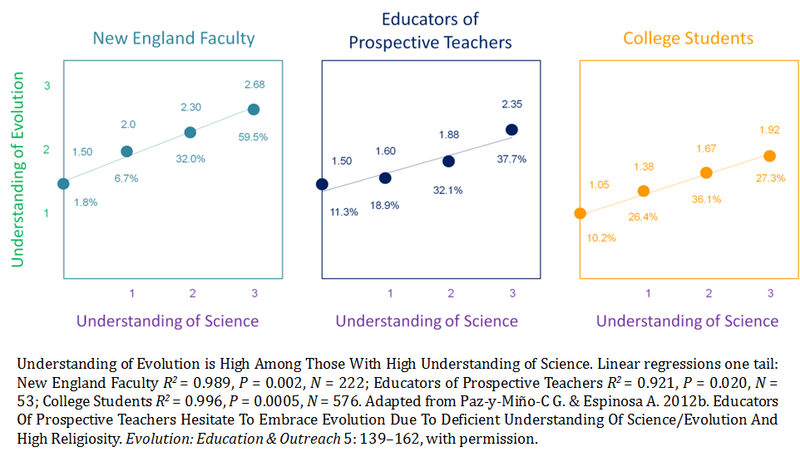 First: quite a few authors have studied attitudes about science, evolution, climate change and GMOs (above) among university faculty (not only us, Paz-y-Miño-C and Espinosa 2011a, 2012a, 2013c, 2014b, 2015, but also Ecklund et el. 2007, 2009, Ecklund 2010 –this group has dozens of publications on scientists’ views about science/evolution and religion –note that although we disagree with Dr. Ecklund‘s interpretation of her work [she is a theist at Rice University and pro-theism in science], we do cite her papers when appropriate. Second: we [Paz-y-Miño-C and Espinosa] use a combination of questions in our surveys, some developed by others, some improved by us, a few generated by us. And we explain that in our studies (2009a,b, 2011a, 2012a,b, 2013c, 2014b), or direct readers to our past publications or cross references. Third: we never “claim [to] accurately measure” anything. In fact, the words accurately, accuracy, or accurate are never even used in our studies. 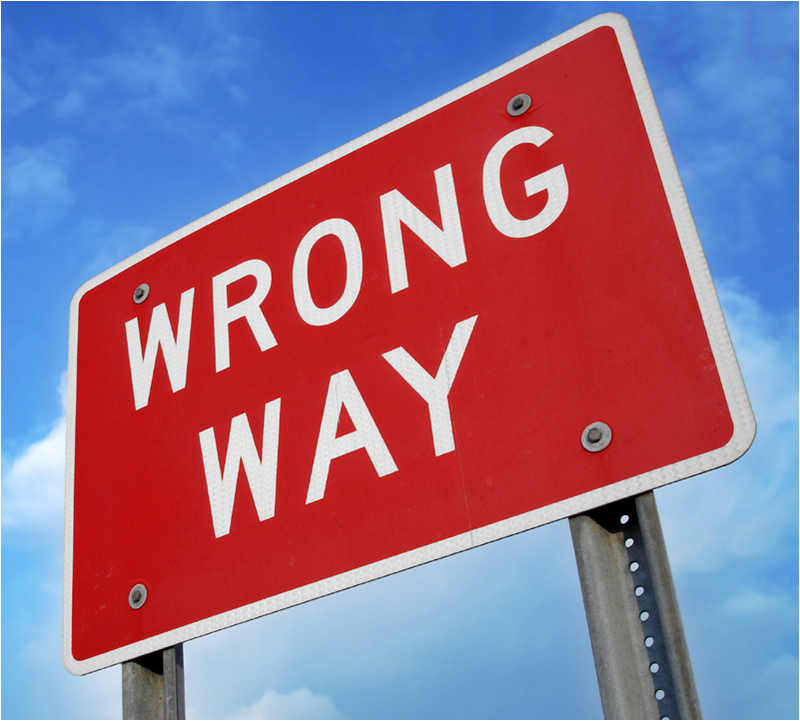 The purpose of any research, more so via polls and surveys, is to assess trends and minimize the margin of error, not to claim accuracy. All polls are based on sampling, which, by definition, leads to approximation. Rice et al. lie when attributing such “claim of accuracy” to us. At this point in our scrutiny of their allegations we must also attribute their remarks to bad-intention foolishness. “For instance, while Paz-y-Mino and Espinoza (both 2011 and 2012) provide an interesting data set, their work has limitations in that it did not differentiate between what types of faculty were responding to the survey. The type of faculty that respond to a survey may significantly impact the conclusions can be drawn from the resulting data. Whether their 244 respondents were non-biologists, biologists, or some mixture of both cannot be ascertained. Second, several of the questions examining viewpoints used a forced choice response with no option of a “none of the above” response, while one question on knowledge used forced choice between five incorrect answers. Neither of these survey question formats is appropriate for determining participants’ views or knowledge (Hawkins and Coney, 1981; Tull and Hawkins, 1993). Therefore, further data on what faculty know, and accept, about biological evolution and the nature of science are needed.” — Rice et al. Hmm: “…[our] work has limitations in that it did not differentiate between what types of faculty were responding to the survey…” Why should we differentiate between these faculty if the conceptual purpose of our paper(s) was other than making such distinction? Why should we conduct the descriptive research in which Rice et al. are interested? The one they value? This is equivalent –and as ridiculous as– to say “Rice et al.’s study has limitations because they did not differentiate between what types of political affiliation or ideology characterized the surveyed population” [which Rice et al. failed to report]. But those interested in ideology-based responses in surveys (e.g. Gallup, Pew, the very Miller et al. 2006, or even us, see Paz-y-Miño-C and Espinosa 2015) do care about political affiliation, ideology and other variables to understand broad cultural aspects of those responding. According to Rice et al.’s logic, their own work has “limitations” because it did not segregate the data by political affiliation and ideology (which Gallup, Pew, Miller et al., and even us have done it). Shame on Drs. Rice et al.! But, let’s get serious. In each of the papers mentioned by Rice et al., we do provide extensive information about the sources of the data (see image below), from which readers can get an idea about where the numbers come from. [Remember that we were not, and are not, interested in examining our samples from the scope Rice et al. wish]. Moreover, colleagues are welcome to request from us data and conduct the analysis they please (of course, we will have to discuss co-authorship). So, not even in this assertion Rice et al. are “accurate.” But, here is the calculating move: do readers see how Rice et al.’s intention is to –via mischaracterization of our work– generate doubt and lead other authors to dismiss our research and be left, by default, with Rice et al.’s? And Rice et al. have done this twice (2010, 2015). Rice et al. assert: “…Whether their 244 respondents were non-biologists, biologists, or some mixture of both cannot be ascertained…” — Rice et al. From Table 1 New England institutions sampled in the study by Paz-y-Miño-C & Espinosa 2011a – The information was given as footnote to inform readers about source of data – click on image to enlarge. Rice et al. continue to remark: “…several of the questions examining viewpoints used a forced choice response with no option of a “none of the above” response, while one question on knowledge used forced choice between five incorrect answers. Neither of these survey question formats is appropriate for determining participants’ views or knowledge…” — Rice et al. Source Paz-y-Miño-C and Espinosa 2013c – click on image to enlarge. And then, Rice et al. reveal, once more, the real intention of their statements: “…Neither of these survey question formats is appropriate for determining participants’ views or knowledge… Therefore, further data on what faculty know, and accept, about biological evolution and the nature of science are needed…” — Rice et al. Really? We caught Rice et al. again: Since neither of our “survey question formats is appropriate,” now the readers are left with a single choice: the solitude of the Rice et al.’s study in the empty infinitude where Rice et al. emerge as the pioneers of proper research, taking a victory lap, carrying each other on their own shoulders… Where is your “non-of-the-above” Drs. Rice et al.? But not so fast: we could actually agree with the Rice et al.’ victorious tone if they had found opposite results to ours, or something substantially different or new in respect to the research done, not only by us, but also by Miller et al. (2006), Hawley et al. (2011), Rissler et al. (2014), or even Kahan (2014a,b, see below). However, Rice et al. 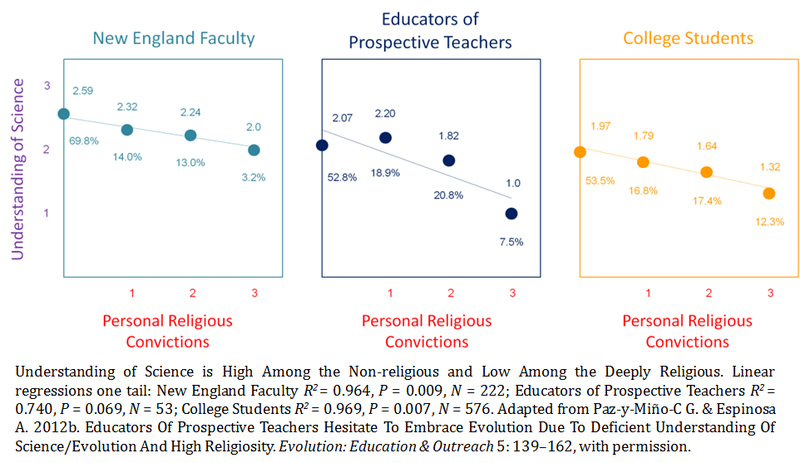 replicated our findings, thus proving the generalization value of our studies conducted at 35 colleges and universities in New England (research faculty) and at 281 institutions in the United States (educators). 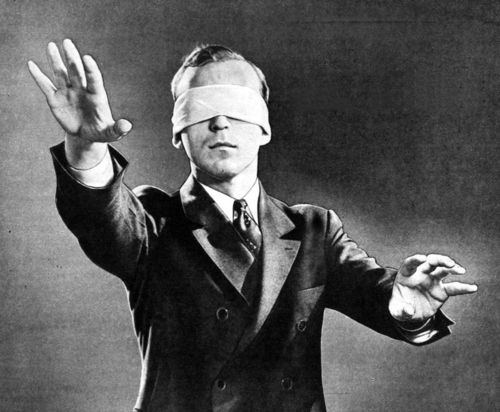 Do readers see how blind folded Rice et al. become when looking at reality? This is precisely the outcome of believing in theistic evolution and evolutionary creation: it disrupts, distorts, delays and stops (3Ds + S) the acceptance of any type of evidence, more so when pro-faith authors devote themselves, and fully, to shot-gun marry evolution and religion. “Another misconception identified in the text responses was confusion regarding how biological evolution works. Multiple participants stated that biological evolution includes (or is) an explanation for the origin of life. As has been pointed out in other publications (Rice et al. 2010) this not the case, but it is a common misconception, even amongst some scientists (Paz-y-Miño and Espinosa 2011a; 2011b; 2012).” — Rice et al. Interesting, Rice et al. call “publications” the single paper of 2010, which not only we debunked (Paz-y-Miño-C and Espinosa 2011b), but also Peretó and Lazcano (2010) corrected and lectured Rice et al. about why evolution can provide an explanation for the origin of life (above). Rice et al.’s semantic confusion about this topic is irreparable, indeed. But, do readers understand why is so important for theistic evolutionists, evolutionary creationists, or Intelligent Designers to remove the topic “origin of life” (or of the universe) from evolution (or from science)? Their goal is to claim that evolution and science cannot explain “origins.” Thus perpetuate faith and accommodation forever (see our latest Paz-y-Miño-C and Espinosa 2015). Rissler, L J., S I. Duncan, and N M. Caruso. 2014. The Relative Importance of Religion and Education on University Students’ Views of Evolution in the Deep South and State Science Standards Across the United States. Evolution: Education and Outreach 7: 24. Kahan, D M. 2014a. Climate-Science Communication and the Measurement Problem. Advances Political Psychology. Kahan, D M. 2014b. ‘Ordinary Science Intelligence’: A Science Comprehension Measure for Use in the Study of Risk Perception and Science Communication. The Cultural Cognition Project Working Paper No. 112, Yale Law & Economics Research Paper No. 504. Hawley, P H., S D. Short, L A. McCune, M R. Osman, and T D. Little. 2011. What’s the Matter with Kansas? : The Development and Confirmation of the Evolutionary Attitudes and Literacy Survey (EALS). 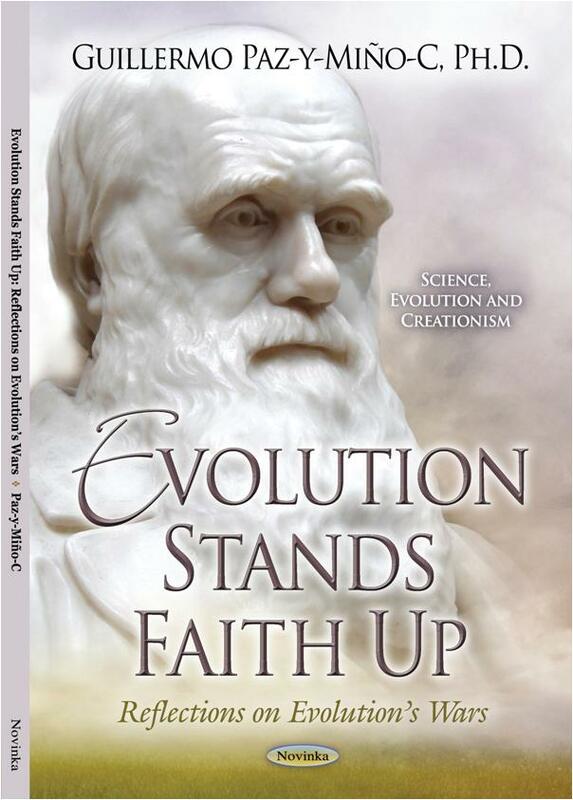 Evolution: Education and Outreach 4: 117–32. CONCLUSION: We have responded to Rice et al. in two occasions after these authors, unknown to us, have targeted our research on acceptance of evolution. We have never peer-reviewed manuscripts authored by this group; we have never met these researchers at any national or international scientific meeting; we have not interacted directly or indirectly with these researchers via mutual colleagues; and we have no interest in building an unproductive relationship with them. But, we will respond to their –or any– attacks on our academic careers that are based on attempting to marginalize our work, due to non-collegial competition, academic greed, or because we have an openly secular approach to examining and understanding the evolution controversy. We have an intellectual interest in the evolution controversy and aim at investigating it under an ultimate level of analysis: the Incompatibility Hypothesis (Paz-y-Miño-C and Espinosa 2012b, 2013a,c, 2014a,b, 2015).